Glasgow is the latest city to embrace a co-operative culture as the launch of the Scottish Schools of Co-operation was launched at Eastbank Primary. Attending schools were treated to pupils explaining all about their Co-operative values and Principles work in practice (picture below) as well as a helpful pack containing lesson plans, homework and assembly ideas. As a follow on to Edinburgh Council’s Co-operative Capital initiative, schools who had successfully completed level 1 and 2 Scottish School of Co-operation Charter Mark were invited to receive their plaques at an event at the City Chambers. Paul Godzik (pictured) congratulated all the young people on their successful applications and the hard work they had been involved in to achieve this. CETS worked in partnership with a number of other organisations to help develop the Scottish Government’s new website, launched by Angela Constance at the Scottish learning Festival, it encourages enterprising approaches within the Scottish Curriculum. Click on Scotland’s Enterprising Schools to find out how co-ops play an important role in Scotland’s economy and how schools are helping to drive this agenda. An exciting opportunity has arisen for a recent graduate to join the co-op movement. Scotland’s agricultural co-op representative organisation, SAOS, and the University of Aberdeen have created a project focusing on the feasibility of establishing a new financial intermediary, to be owned and governed by Scotland’s farming community. As a result, they are seeking an individual to manage all aspects of the project, which is funded by a government graduate scheme. CETS and the University of Aberdeen have previously delivered a similar project through the same Knowledge Transfer Partnership (KTP) scheme. A group of Eastbank Primary pupils, in Glasgow, have agreed to help spread the co-operative message about how important values are in who you are and what you do! CETS have employed them after hearing all about how giving “values” a personality and purpose have helped give “power to the pupil” in monitoring and modifying their own behavior. When asked why they thought this programme had worked, the first answer was, “because it was fun”! The “fun” is in pupils exploring for themselves what theses values mean and where they see them in not just their everyday lives, but also in art drama, RME and storytelling, then sharing this new-found knowledge with others. Eastbank pupils have kindly agreed to look at the co-op values ( link to V and P page) in the same way and come up with a toolkit for schools, to help them understand where to look for and find the co-op values anywhere from the Gorbals to Ghana! The toolkit will possibly also help pupils understand what it means to be a co-operative and also how to use these values in setting up their own co-op. We are at the start of a very exciting project, so keep checking to see how it is doing! 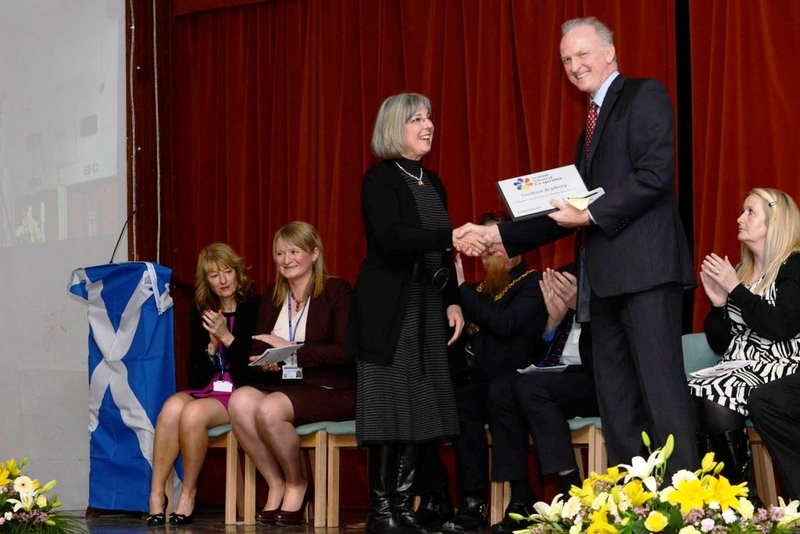 On Monday the 22 April, Loudoun Academy were presented with their plaque at an awards ceremony attended by parents, students, partners, The Director of Education Services as well as the Provost, to mark them becoming Scotland’s first School of Co-operation. Morag looking lovely as always. It was a very co-operative event as the school was also giving awards to over 60 students who had volunteered up to 300 hours each in their local community! LACE – the Young Co-operative in the school, also gave an excellent presentation about their business. They explained what it meant to them to be a young co-operative and how the values and principles shaped their business, as well as what they were doing to help others with their profits. All the students’ presentation were very articulate and entertaining and an excellent time was had by all. Many thanks and congratulations to everyone who made this event such a success! Friday marks the end of CETS’ time at Robert Owen House, Glasgow. We’re moving to the Co-operative Group’s new distribution centre in Newhouse. While sad to say goodbye to the building that has been our home since 2006, we’re excited by the change and work continues as normal. And you never know, a change of location might provide a vital spark of creativity for the year ahead!